The one and only official guide to all things Discworld including, but not limited to: What to do when approached by a hermit elephant, where to get a beer in Ankh-Morpork, how to play Cripple Mr Onion, and live to tell about it. If you're looking for the ultimate authority on probably the most heavily populated - certainly the most hilarious - setting in fantasy literature. . . If you need a handy guide to Discworld locales from Ankh-Morpork to Zemphis. . . If you want help telling Achmed the Mad from Jack Zweiblumen. . . If your life depends on being able to distinguish the Agatean Empire from the Zoons. 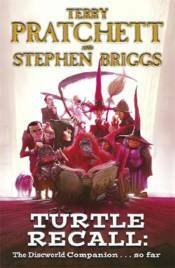 . .
. . .look no further than THE COMPLETE DISCWORLD COMPANION - now fully updated and completely up to SNUFF!